Princeton is lucky to have a number of really great local businesses. Despite the combined onslaught of the big box chain stores and internet shopping, these businesses have survived and play a great part in making our town an interesting place to live. We all want our local merchants to be successful, and one way we can help them is by increasing the amount of walkable housing. Walkable housing helps businesses by putting customers close by. Consider a store like Nassau Seafood & Produce (pictured at top). We all know about the fish- it’s excellent. But who is buying the produce? If you’re buying produce, you have quite a lot of choices. The produce at Nassau Seafood is absolutely top rate, but Austin, TX-based Whole Food Markets, who have a huge store on Route 1, also offer good produce, and can benefit from economies of scale that come from being a national chain. One clear reason why people would shop at Nassau Seafood & Produce instead of at Whole Foods Market is because it’s more convenient. If you happen to live nearby, it’s much easier to pick up apples and milk at a Princeton local store than to drive down to a Route 1 supermarket. Now, you may choose to drive down to a Route 1 supermarket from time to time, but if you have a store like Nassau Seafood & Produce in walking range, it makes it far more likely that you’re going to go and buy something there. That’s why adding walkable housing in Princeton is one of the best things we can do to help our local merchants. 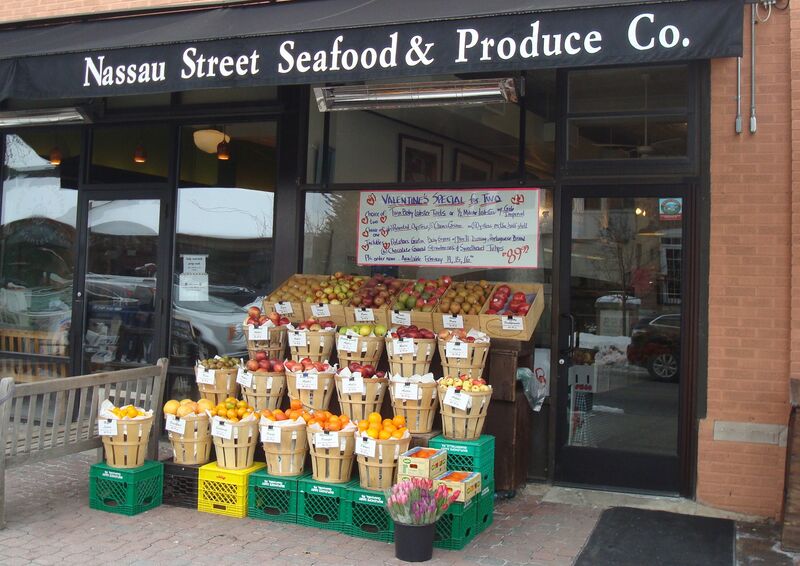 Nassau Seafood & Produce benefits from being close to a lot of walkable housing. The University and Tree Streets neighborhood bring a density of people that helps sustain local businesses. If you go to the more suburban parts of Princeton, do you see thriving local businesses? No- and that’s because there aren’t enough customers nearby to support those businesses. In future, things are not going to get any easier for local merchants. More and more things can be purchased on the internet and delivered to our doorsteps. If we’re going to sustain our local businesses, we should add more walkable housing around the town so that more people can reach our great Princeton stores on foot or by a short trip. A walkable community is a community that shops local much more often. Planning based on cars and drive-to-qualify only benefits the big box stores. Do you ever walk to your local stores? What kind of things do you buy in Princeton? And is there any hope for our remaining small merchants to survive? Have your say in the comments below. This entry was posted in Downtown Vibrancy, Princeton, Zoning and tagged business, housing, planning, Princeton. Bookmark the permalink.